Has someone asked you to marry them? Terrific! Many Congratulations. Are you secretly hoping that they will do? It is so very exciting! We love weddings at South Bersted. As a parish church, anyone who lives in the parish or is on the electoral roll of the church is entitled to be married at St Mary Magdalene. To see if you live in our parish, please type your postcode into this website. You may also have a qualifying connection with us. We're thrilled when people get married because marriage is a gift from God to everyone. We're keen to support those who enter married life and so we offer preparation sessions to those having their service at South Bersted. These are designed to help couples understand and plan their services, as well as to prepare for life together as a married couple. Want to know how much it will all cost? 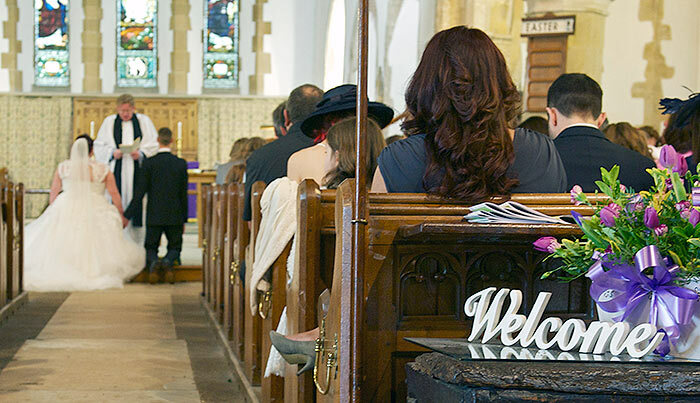 A full summer wedding service in 2019 (with banns being read and a certificate, organist, bells, some flowers and a verger) will typically cost around £685. "I just wanted to say thank you for yesterday, the (wedding) service was perfect."